After barely escaping cancellation for the last two years, it looks like the network grim reaper has finally caught up with According to Jim. The ABC sitcom is ending its long run at the end of this season. The network hasn’t announced it but one of the series stars has. 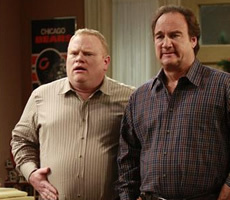 According to Jim is a lighthearted sitcom that revolves around a suburban father named Jim (Jim Belushi). Though he means well, he often gets into trouble while trying to be the king of his castle, manipulate his beautiful wife Cheryl (Courtney Thorne-Smith), and trying to raise his kids (Taylor Atelian, Billi Bruno, and Conner Rayburn). Adding to his troubles are Cheryl’s strong-willed sister, Dana (Kimberly Williams-Paisley), and her hapless brother, Andy (Larry Joe Campbell). Other series performers include Tony Braunagel, John Rubano, Mitch Rouse, and Charlie Hartsock. The ABC sitcom debuted back in 2001 and averaged 10 million viewers for its freshman year. Jim’s audience grew in year two to over 10.6 million. The ratings remained fairly consistent for seasons three and four as well. The numbers started to decline after that and by season six, it was averaging just 6.65 million. To be fair, it was often scheduled against the hugely successful American Idol. Yes! Like two seasons ago! No! I still love it! So, it looked like Jim was doomed to be cancelled in May 2007. After all, the network had also already cancelled the similarly-rated George Lopez. And, when ABC announced its fall and mid-season schedules, Jim wasn’t on either of them. It was later announced that the series would return for an abbreviated season of 18 episodes. Year seven kicked off in January 2008 and the season averaged only 5.3 million viewers, a dismal showing for a series on a major network. You would think that the sitcom’s fate would be sealed with those numbers but Jim was miraculously renewed for an eighth season. It turned out that the renewal had little to do with the ratings and everything to with syndication revenue. The sitcom is produced by ABC’s in-house production company and it makes a lot of money for the company in off-network reruns. Between the future syndication sales and fewer pilots having been produced (due to the writers strike), it just made financial sense for Jim to come back for another season. Since the sitcom kicked off in December, it’s averaged just 5.07 million viewers. Production on season eight has been completed for awhile and apparently, enough is enough. Though ABC hasn’t said anything about the Jim’s fate, one of the show’s stars has. For fans of the show, there is positive news. There are still a dozen unaired episodes left in this season. Though the sitcom isn’t currently on ABC’s schedule, it seems likely to return at some point, possibly opposite Idol. If not, you’ll certainly be able to see them in syndication. I personally am sick of the lovey dovey shows. Bring back Inhumans, or Agent Carter, or Marvels Agents of Shield!!!! I hope according to Jim will back > !! Why didn’t they count the rest of the world where it is on television?? Here in Holland we love it. I really liked this show. I was able to watch it with my nieces and that is pretty hard to do with shows in this day and age. Why was this cancelled definetly one of the best shows on tv. Bring back according to jim! Please bring JIM back , best show ever……. The best show ever, It’s really sad that the show has been canceled. I did enjoy watching the show, it’s one of the funniest TV shows ever. I like the humor. I bet if you count the number of people who watched the show world wild they will exceed 20 Mils.